If you have a lot of neck pain and can’t figure out why—rather than continually trying to get a diagnoses for a cervical spine problem—you may want to shift your focus to a nearby area of your body; your jaw. Estimates vary, but experts say that up to 70 percent of neck problems may be related to dysfunction in the temporomandibular joint. This may come in the form of neck muscle spasm (50 percent of cases according to a 2015 study published in the Journal of Physical Therapy Science Research), reduced flexibility (20 percent according to the same study), or plain ‘ole pain, which the authors noted at 30 percent. And the reverse may be true, as well. The study mentioned above found that poor neck posture may well be a cause of jaw dysfunction and pain. You may be wondering what I mean by jaw joint dysfunction. Let’s start with the bony structure, which is often called by its acronym, the TMJ. 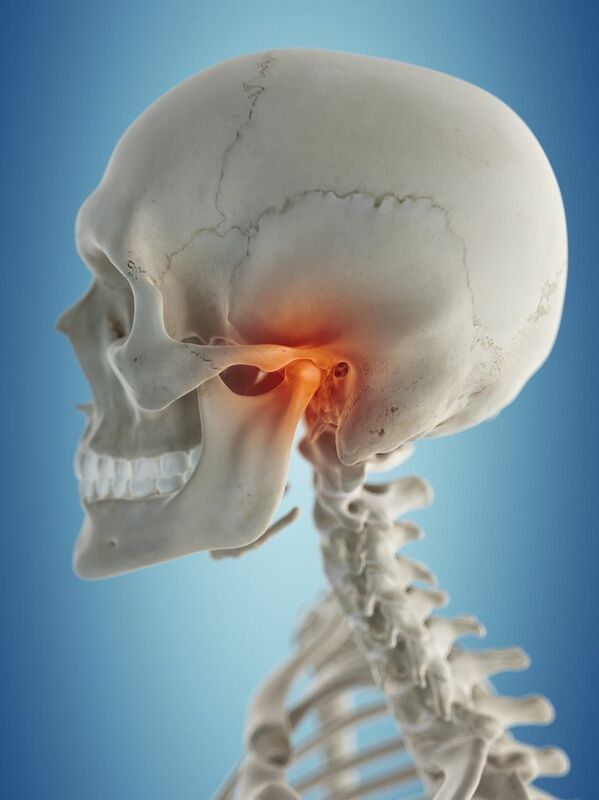 The TMJ is perhaps the most complicated joint in the human body. Even though it’s small, it has many intricacies to its architecture, from the unique shapes of the articulating bones to interwoven connective tissue that forms the surrounding capsule and enters the joint itself. The TMJ also features a disc, which unlike spinal discs that serve as shock absorbing cushions, is there to stabilize the joint and to obscure muscles and ligaments that keep the joint in place and help move it. To help you comprehend exactly where the temporomandibular joint is located and how it’s constructed, you can break this compound word down into two parts, each of which refers to the bones that comprise the joint. Let’s deconstruct this name so that you can make some sense of the anatomy involved. The first part, temporo, refers to the temporal bone. The temporal bone is located on either side of your skull towards the bottom (near your ear). One thing that may help you find your temporal bones is to put your hand on your temple. The temporal bone is located just underneath that, so if you slide your hand just a little way down until you feel hard bone, you’ve found the upper bone of the TMJ. The second part of the word is mandibular, which refers to the bony structure that moves up and down, and to a lesser degree, side to side, during the act of chewing. I probably don’t have to tell you this, but the mandible is host to your bottom set of teeth. The mandible is considered to be the jaw bone. An interesting fact is that it’s the only bone in the face that can move. The mandible is shaped like a U. At the top of the sides of the U, the bone bifurcates (upward) into two separate “processes,” which are extensions of bone that taper, to some degree, at the ends. The front process is called the coronoid; a couple of key muscles attach to the coronoid process, but all in all, this area is not part of the TMJ. The back process is called the condylar process; it is the part of the mandible that articulates with the temporal bone to form the TMJ. The temporomandibular joint (TMJ), then, is the area where the temporal bone and the condyle of the mandible come together. It’s a synovial joint, which means there’s a capsule made of tough fibers surrounding both bones and the space in between. Also inside this space is a specific type of fluid aptly named synovial fluid, plus a disc that helps keep the joint stable and the movement the joint makes in good integrity. Two types of movements occur at the TMJ: hinging and gliding. This combination further classifies the joint as ginglymoarthrodial. And as with pretty much any joint in the body, a number of muscles act on the TMJ; as you will see in the next section, muscles that become too tight or out of balance relative to one another is one way TMJ dysfunction may result. TMJ dysfunction is one category of a much larger group of problems that are commonly referred to TMJ disorder,. Along with the causes talked above below, TMJ disorder may result from trauma, postural issues, dental issues or a psychiatric condition. To understand how your TMJ contributes to or causes your neck pain (also how the structures of your upper body contribute to your TMJ problem), consider learning about the two main types of TMJ dysfunctions. While there are other potential conditions your doctor may consider when working up a diagnosis (mentioned briefly above) temporomandibular joint dysfunction (TMJD) is often be attributed to the way you habitually open your jaw or a displacement of the disc that’s located inside the joint. But in protrusive jaw opening pattern, these helper muscles, which are called the lateral pterygoids, are so tight, they instigate a change in the normal order of component movements that occur in mouth opening. This not only makes the lateral pterygoids even tighter, but it can lead to problems with the disc that’s located inside the joint. Next, let’s talk about the most common TMJ problem that is related to the disc inside that joint. This is called disc displacement with reduction. Normally, the position of the disc depends on its shape as well as the degree of pressure that is put on it. As far as the shape of the disc goes, this is something you’re born with, and therefore, is rarely, if ever, a medical problem. But the pressure that’s placed on that disc through tight or imbalanced muscles and/or dysfunctional joint movement is something that doctors can diagnose and treat. Excessive pressure is generally caused by the way too-tight jaw muscles affect the fit of the joint, as well as the other soft tissue that affects it. Disc displacement with reduction is the first of three stages of disc displacement. With disc displacement with reduction, you’ll likely hear joint noises when you open and close your jaw, and bringing your lower jaw (mandible) forward reduces these noises. You may also get pain when you chew, yawn, talk, or if (and when) you grind your teeth. Opening your mouth may be difficult, too, but this is not always a symptom. Without treatment for disc displacement with reduction, this TMJ problem may progress to the second and possibly third stages. Stage two is disc displacement without reduction where, like before, you get clicking and popping in the joint. This time, though, the joint may from time to time lock up, and you may also have some intermittent problems when opening your mouth. Stage three is where the problem becomes chronic. By the way, you should be on the lookout for “red flags,” which are symptoms that may indicate nerve involvement or damage, or a more serious TMJ condition. These include numbness, swelling, nosebleeds or sinus drainage problems, unexplained weight loss, hearing problems, constant pain (not related to your jaw), or symptoms that simply don’t respond to any TMJ treatment with which you may be engaged. If you have any of these, be sure to discuss them with your doctor and/or the physical therapist who is treating you. So what does all this detailed information mean about your neck pain? For the most part, TMJ dysfunction is driven by dysfunction in one or more of the muscles that keep the joint in place, affect the pressure of the disc and so forth. But when it comes to the musculoskeletal system, there’s really no such thing as isolation. This means that a misalignment in your TMJ that starts with an extra tight lateral pterygoids, for example, can easily affect the conditions of other muscles that both respond to and influence the position of that joint, and the position of your head, neck, and upper body. In this way, the muscle tension or weakness and movement dysfunction that starts at the TMJ is transmitted to your neck, shoulders, upper back and possibly your lower back. A wise diagnostician will evaluate not only your TMJ but at least the posture and positioning of neck and shoulders, as well. Not only that, but chronic upper body misalignments may feed your TMJ problem. This is especially true if you have forward head posture, which is a very common misalignment of the head in its relationship to the neck. Forward head posture is usually preceded by another posture problem presents itself in the upper back known as kyphosis. A kyphosis is basically a rounded upper back. When the upper back rounds over, the head, being connected via the spine, is taken downward. In order to see and interact with the world in front of you, you’ll likely kink at the back of the neck as a way of lifting your head, and probably crane your head forward, as well. All this may put your jaw at a mechanical disadvantage, which in turn can add to your TMJ troubles. Addressing your upper body posture (with non-surgical methods) will likely help improve your jaw biomechanics and range of motion. TMJD treatment may help relieve some or all of your pain, as well. Without treatment, you may be setting yourself up for a cycle of dysfunction that is communicated back and forth between the jaw and the neck and shoulders. One of the benefits of physical therapy is to interrupt this loop and instead allow soft tissues to get back to their normal lengths. This may help restore the appropriate sequence of movement in your jaw, offering positive healing effects to the disc as well as your upper body posture. Some of the things you may experience in treatment include manual therapy to release tight muscles, stretching and strengthening exercises to help establish good posture, especially in the upper body area, and a bit of an education around how to keep these positive gains going. Your therapist may also teach you a self-care routine that involves progressive isometric strengthening of your jaw muscles. Evick, D., M.D., Correlation of Temporomandibular Joint Pathologies, Neck Pain and Postural Differences. J. Phys. Ther. Sci. 2000.